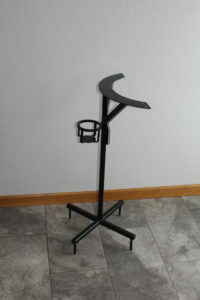 Today’s blog is going to focus on bag stands. 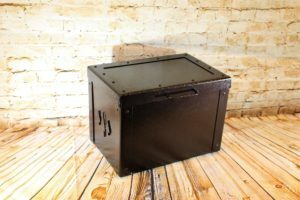 We have about 5 styles that are usually requested, but every once in a while we’ll have a customer who wants something completely out of the box (we love that). 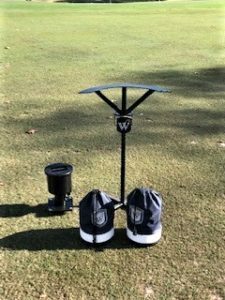 We re-did the driving range accessories for The Clubs at Cordillera Ranch in Boerne, Texas. 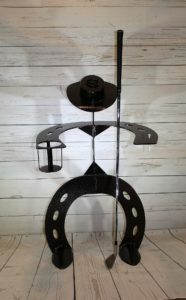 The star of the show on this project are the cowboy bag stands. 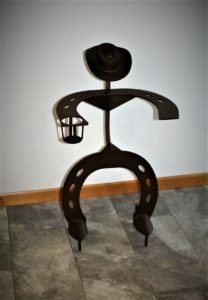 Notice all of the details in the hat and the spurs. 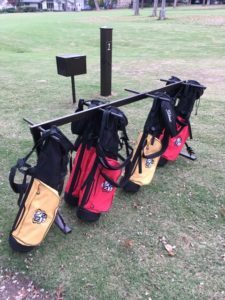 This stand is designed to hold a few clubs and not a full bag (that’s what they’re used for most of the time anyway). 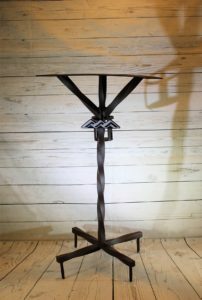 This blog is labeled ‘bag stands’, but we have to show you some of the other range accessories that Cordillera Ranch did that ties in this ‘ranch/western’ theme together. Consistency on the range is key.. 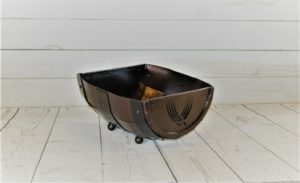 The 1/2 barrel ball baskets that we make look like whisky barrels and fit about 200 balls (2 sizes available). 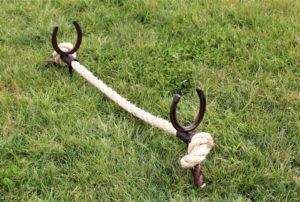 The dividers that we made were of high-quality and thick rope with horseshoes on either end, which fits great for this course’s theme. 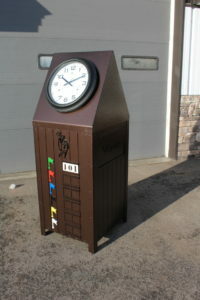 Then there’s the club cleaning station and driving range A-frame clock. 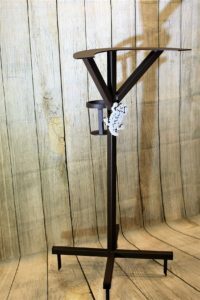 All of their products were powder coated a semi-texture brown for durability and to give a rustic look. 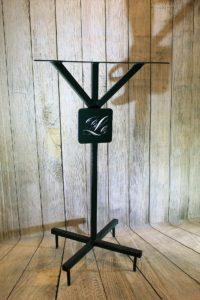 Another Texas client, Westwood Golf Club had us customize the ‘upright square bar bag stand’ that we make. The cup holder fits their club’s cups perfectly. This stand gives a nice clean look to their range. Simplistic is perfect sometimes, don’t you think? 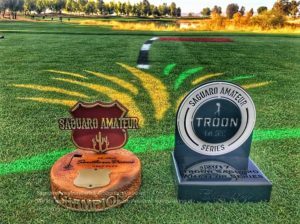 Desert Mountain Club is one of our many Scottsdale, Arizona clients. They chose an ‘upright twisted bag stand‘. 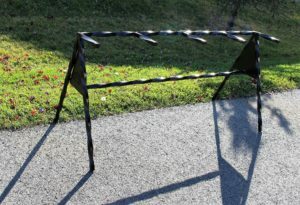 In this style we use 1″ twisted metal bar for a beautiful look. There’s 2 holes for alignment rods on the half-circle portion and a cup holder behind the logo. 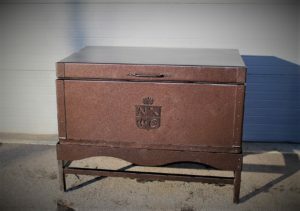 We also used a brown semi-texture non this. 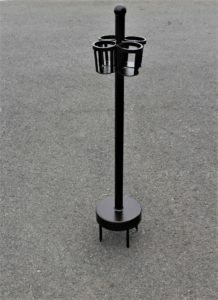 For PGA WEST Private Clubhouse & Golf Courses in La Quinta, California we did the ‘upright square bar bag stand‘. 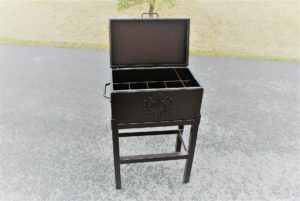 This is one of our clients who likes to use Dark Bronze as their powder coat. It has a slight shimmer to it if you look really close in person. Most of the time it looks dark brown if your eye balls aren’t directly glued to it, though. 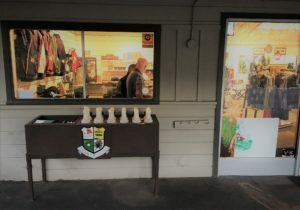 We re-did the range for Whirlwind Golf Club. 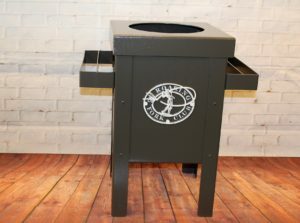 We’ve made their wine barrel range targets a few years ago which was a great start, but this time we were asked to make their bag stands, ball baskets, club cleaning stations, clocks, signs & trash can enclosures. 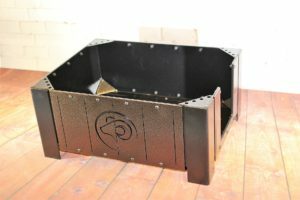 Here’s a peak at their ‘A-frame square bar bag stand’. 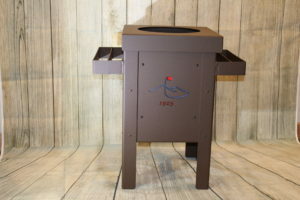 They have a beautiful oven basket logo, but they decided on their stands to keep it simple with just their name. 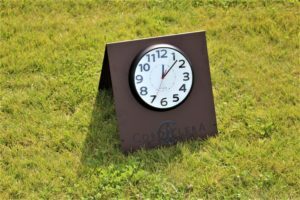 Here’s a photo on our office lawn and then on their range. Thanks for reading our blog, and we’ll make sure to post again soon! There’s a lot more exciting custom projects in the works!! Love the wood paneled look, but hate the upkeep? 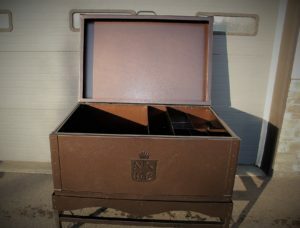 That’s why we started our ‘metal teak line’. 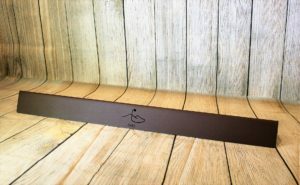 What’s unique about the Rams Hill Golf Club (in Borrego Springs, California0 project is the teak paneled look that we’ve done on most of their products. 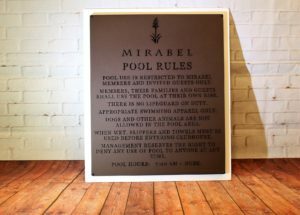 It gives a ‘wood-look’, but without the commitment of sealing and staining.. We used a beautiful powder coat called Copper Vein..
Next is the Twin Dolphins project. 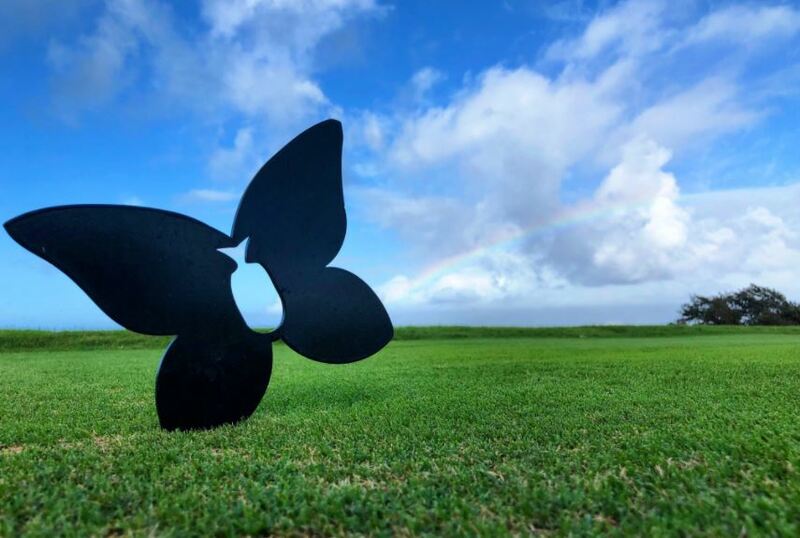 They’re a new high-end course in Mexico that’s opening. 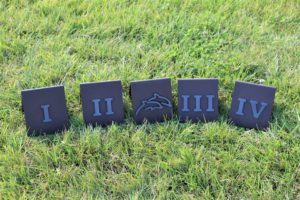 We made their driving range accessories and tee markers. 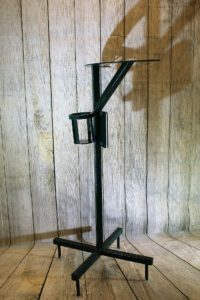 We designed a new bag stand that we’ll show off here in the next few weeks. 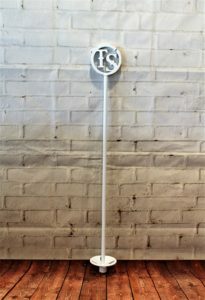 Notice on their products how all logos and numerals are either flush mounted or inset, which creates a beautiful look. 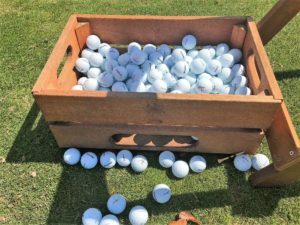 Let’s start today’s blog with the ball crates that we made for Mountainbrook Country Club. The bottom has a ramp inside to lean the balls towards the opening. 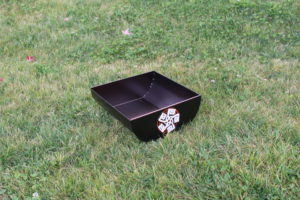 The ball boxes that we make are easy for players to use. Below is a photo of why we personally don’t like use the other crates out there on the market (balls got stuck on this one). 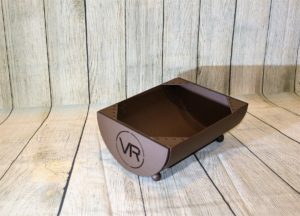 We’ve shown the half barrel ball baskets off on our website/blog before, but the ones that we made for Victory Ranch in Utah have corners for tees. It’s a nice added touch. 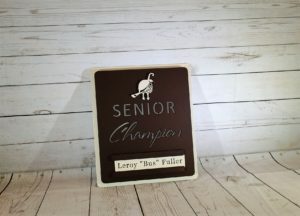 Driving Range/Amenities Boxes: Usually we’re asked to build these about 42″wide by 20″, which gives a significant amount of storage space for towels, bags of balls, and trinkets. 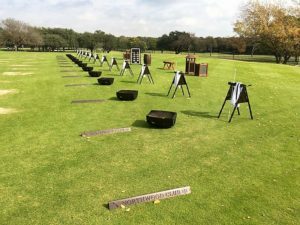 The Northwood Club in Dallas, Texas wanted smaller versions for their 1st tee and range (28″ wide to 30″wide). 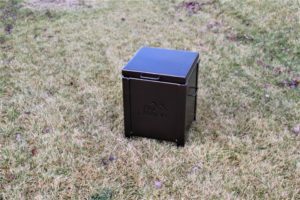 These compact versions of our range boxes are perfect for storage, but without taking up a lot of room. 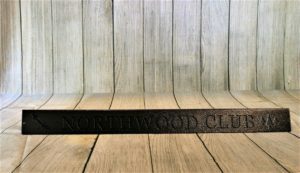 Northwood also has the large version that we made last Fall. 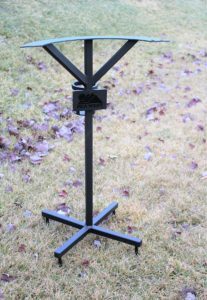 Next, for driving range accessories is the bag stand that we made for Troon North in AZ, the club cleaner & range dividers for Lookout Mountain Club. 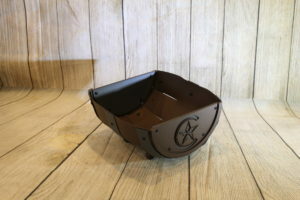 The wine barrel range targets have been getting quite a few orders in the last couple of years. 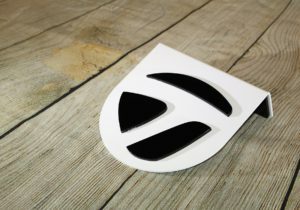 Usually courses want to brand them with their logo, but in this case the client wanted to keep it simplistic. That’s all for today, be sure to keep looking at our galleries since we update them weekly. Thanks!!! 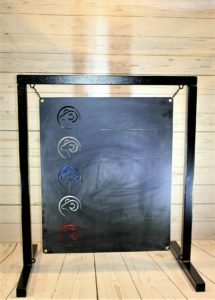 Looking for an alternative to ball pyramids? 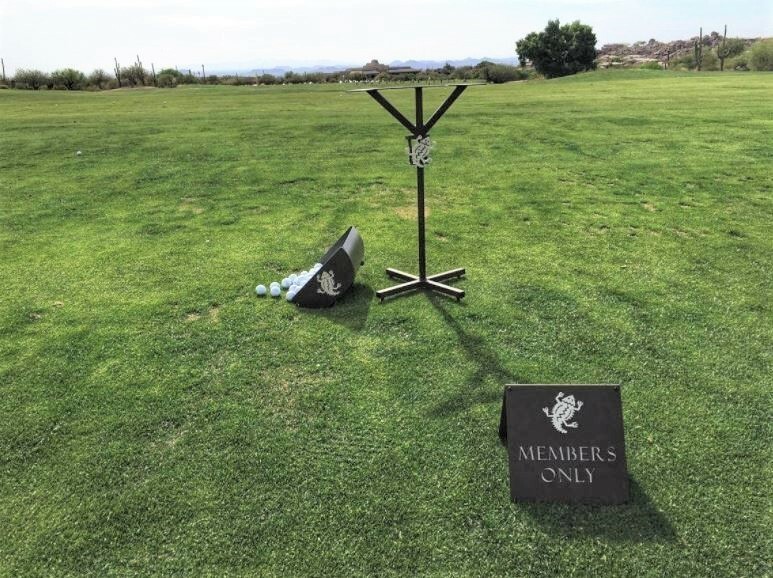 At RHI, we offer creative and custom solutions to update your driving range. 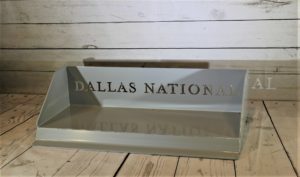 Dallas National & Winterhaven CC asked us to make custom ball trays that give a clean look to the range. 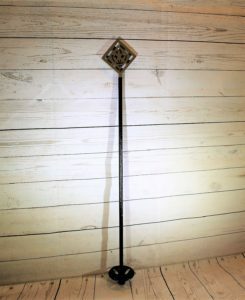 These are easy for staff to stack and for players to use. 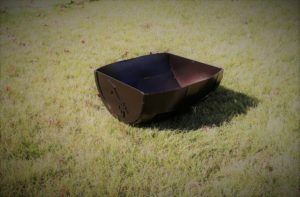 Another driving range solution, are the barrel ball baskets that we’ve been making. 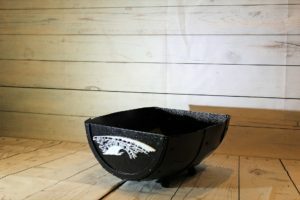 This past week we’ve made them for Valhalla & The Bridges at Santa Fe. 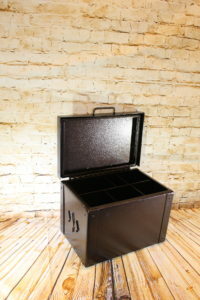 Here’s a look into our ball box gallery for more style options. 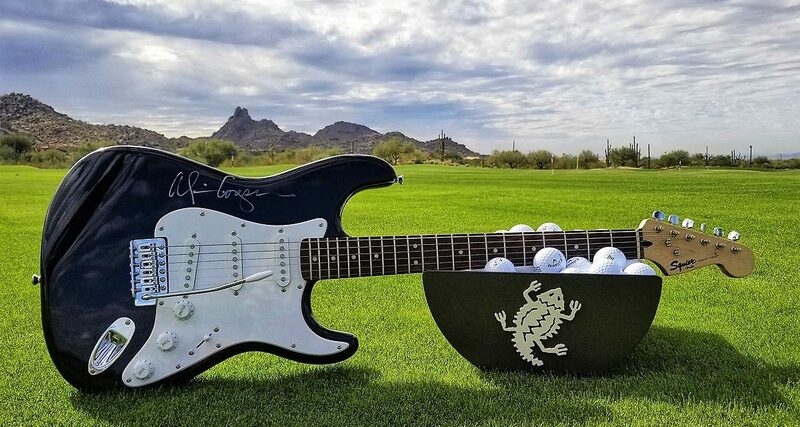 While you may have been at the PGA Show in Orlando, we stayed back and got as many custom projects out the door as possible! 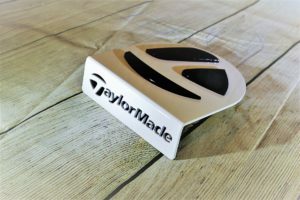 We sent out tee markers for TaylorMade to use on Demo Day at the show on Tuesday. 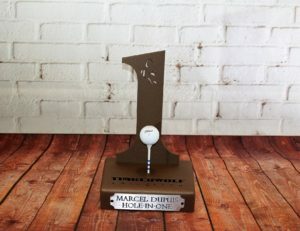 We also made tee markers for Teton Springs and re-orders for Westin Kierland. 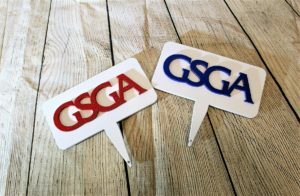 Lastly, for tee markers made sets for GSGA. I like how nice their logo stands out against the white powder coat. 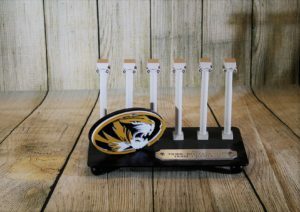 For tournament awards, we made a re-order for University of Missouri and shootout awards for Sunset Country Club. 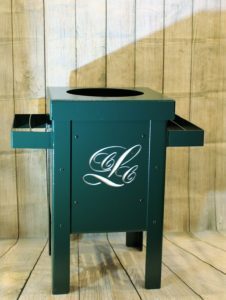 Louisville Country Club will soon be getting their bag stands, club cleaners, and half barrel ball baskets. I love the green that they chose; it’s GN220 and has a durable hammer texture to it, so it won’t scratch easily. 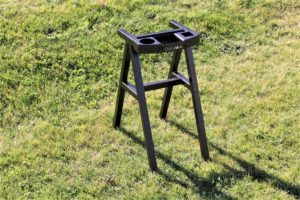 It’s a great powder coat for driving range furniture. 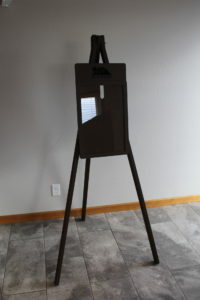 Next up is the custom easel that we made for PGA West. That’s all to share for now. We have several big projects in the works that we’ll soon be sharing. Have a great weekend! 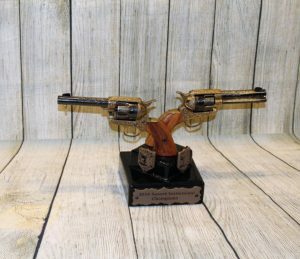 We won’t be at the 2018 PGA Merchandise Show in Orlando this month, but we’d love to set up a time to talk over the phone about your next project! Here at RHI Headquarters it may be snowing outside and freezing, but we’re in-gear for Spring Opening Day. 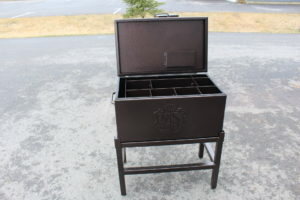 Our clients are ordering early, and we’re getting their custom projects out the door! 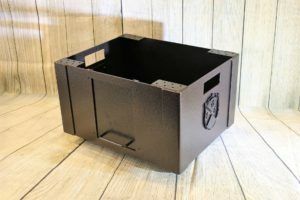 We’re going to give you the ‘rundown’ today on what we’ve been building lately so that you can get inspiration and then get started with us on the design/order process. 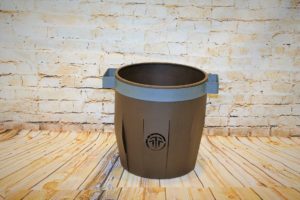 Talking Rock put in an order for the barrel ball buckets. 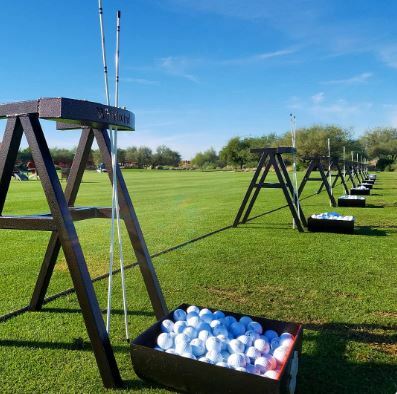 These hold about 150 balls and give their driving range a unique presentation that traditional ball pyramids just don’t give.. 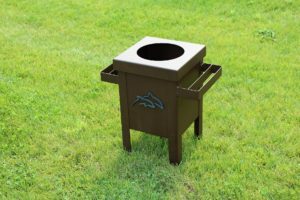 The Country Club at Winter Haven was our ‘guinea pig’ with our new ball tray design. 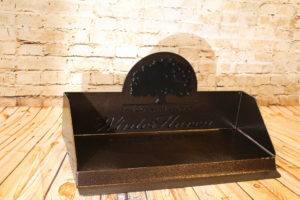 Yesterday, I received at email from our contact there, and Josh said that they really like these trays. 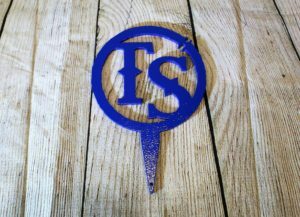 As a custom shop, we make things for the ‘first time’ weekly. It keeps things creative and interesting. 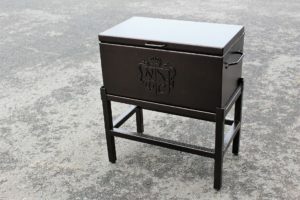 Another custom project that we were asked to do was for San Jose CC. 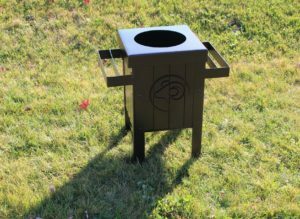 We built a custom sand & seed table with sections for amenities like tees, divot repair tools, ball marks, etc. 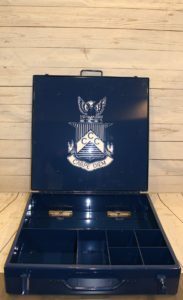 Then we did a divot mix box for Pine Canyon CC. 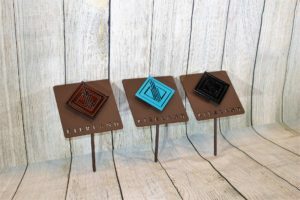 We shipped out mini-flags for Teton Springs yesterday, and then some for Vasari last week. 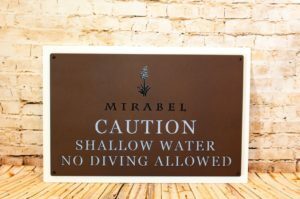 Now for Golf Course Signage, Mirabel had us make new pool signs for them. 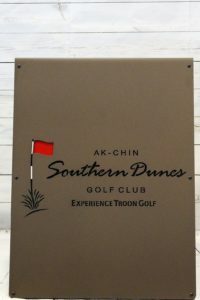 They turned out nice in my humble opinion..
Here’s the driving range clock sign that we did for Ak-Chin Southern Dunes Golf Club, and the parking log sign that we did for Troon Country Club (show without the post). 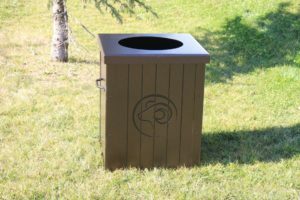 Here’s the trash enclosure, yardage sign and driving range ALL IN ONE COMBO that Fiddler’s Elbow had us custom design for them. 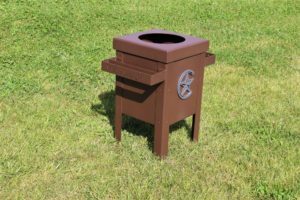 This was produced from a sketch that they emailed us..
We’re starting on the Roaring Forks Club driving range project, but here’s a sneak peak at one of their products; club cleaners. They are using a textured hammer color called ‘Bronze Hammer’. 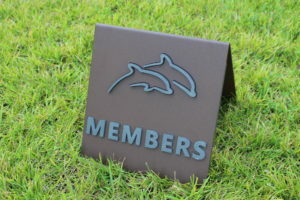 It’s a new powder coat that we’ve been using for a couple of clubs, and it looks really nice.. 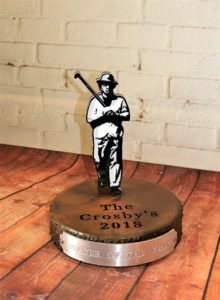 Even though it’s January NOW IS THE TIME to start putting in your trophy orders if you can for Spring and Summer. 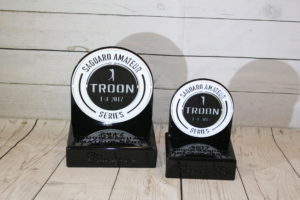 It’s good having your trophies early because 1) less stress 2) trophies can create a buzz if you share a photo of it to your members and/or have the champion awards in the golf shop for display.. Here’s a look at the trophies that we made for The Crosby Club, Southern Dunes and a Hole-in-One award. 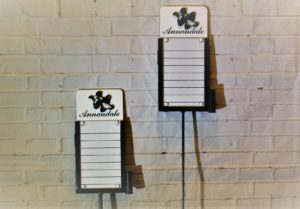 More tournament supplies that came out this past week were the proximity markers for Annandale Club + starter boxes & trays for Capital City. Thanks for reading our blog. The SPRING SEASON IS COMING, so there will be much more to post very soon!! 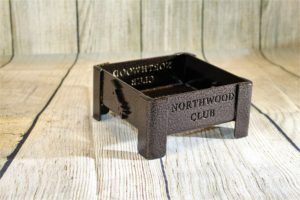 We recently built the driving accessories for Northwood Club in Dallas, Texas. 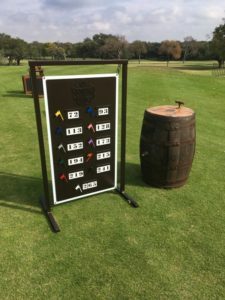 We worked closely with their team to design custom made driving range accessories. 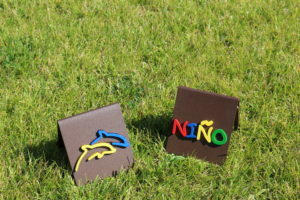 Every detail was carefully thought out to give the best presentation possible. 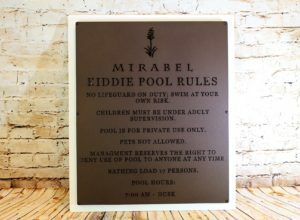 Notice how each product has a beautiful copper vein powder coat and symbols from their logo. 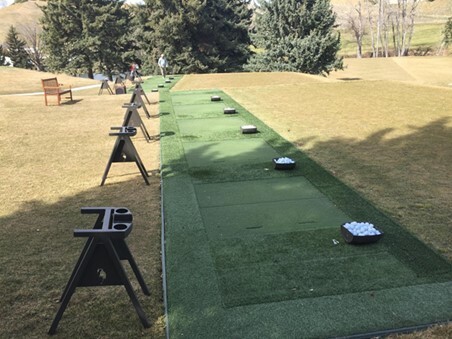 Here’s what their driving range looks like this month with their new rhi setup. 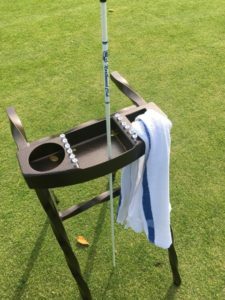 We designed the bagstands so that the could use the trays for a bottle of water, alignment rods, tees and either a towel or a range finder. This driving range sign has removable flags on it in case there’s any changes down the road. Here’s an up-close photo of their range dividers. 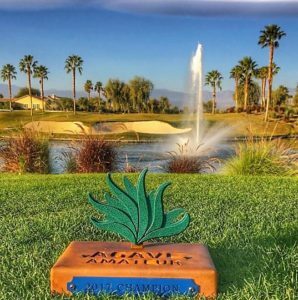 Because there’s a small space on the dividers, the course name often works better than the icon logo. Because of how much activity is on their driving range, we built their ball staging baskets larger than we do on average. 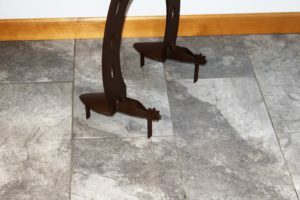 We’re custom, so we’re happy to work with the dimensions that you think would work best at your particular facility. 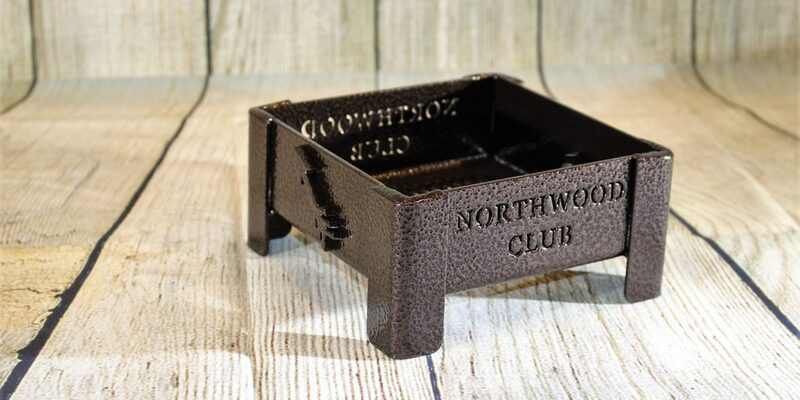 Broken tee boxes continue with the presentation, so we kept a high-level of detail on these for Northwood Club. 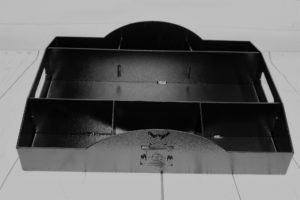 Below is the customer designed scorecard box/amenity box. It’s 100% custom, and perfect for their needs. 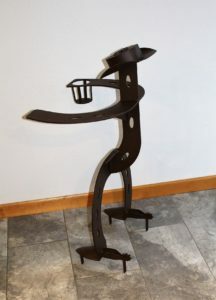 Then there’s the beverage caddie. In this case, we all felt that a ball cap looked better than adding a logo. Sometimes simple is best. It continues the presentation with the same coloring as the other products. 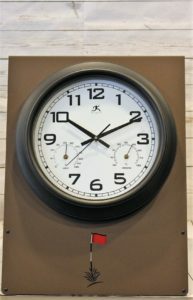 Here’s a couple of photos of their driving range box that we took at our shop. 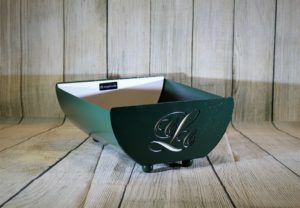 Half of its designed for towels, while the other half has custom dividers for amenities that they need on hand like bug spray, sun screen, athletic tape, aspirin, etc. 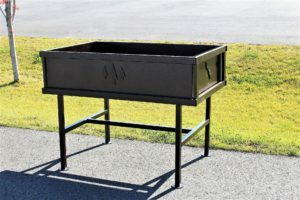 This Amenity Table actually comes from our driving range cart designs, but our customer didn’t need the wheels or cooler so we designed their product with just the ‘bed’ portion. 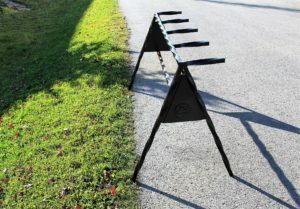 Lastly, is their bag drops, which they call their ‘Sunday Bag Rack’. We’re excited to be in the works of another custom build for them. 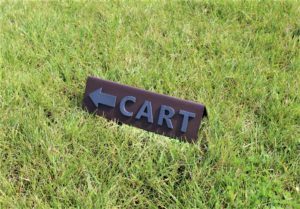 They have a beautiful course, and we’re happy to have had the opportunity to build their range accessories and signs.